Join the discussion on our forums! Come discuss Acolyte of Agony over in our dedicated Acolyte of Agony discussion topic. The only interesting thing about this card is that it shares the artist withTirion Fordring. Should read "Deathrattle: Restore 3 health to your hero"
Because that's all this overpriced and crappy card will ever do. On first impression it seems awfully mediocre, but it's actually quite apt as an anti-aggro tool for a highlander priest, especially considering the extremely limited anti-aggro tools a higherlander priest has at its disposal and the only other 1-of 3 drop minions worth considering being Curious Glimmerroot, Kabal Talonpriest, Tar Creeper, Stonehill Defender and Kabal Courier. Against aggro, this'll often heal for 6. 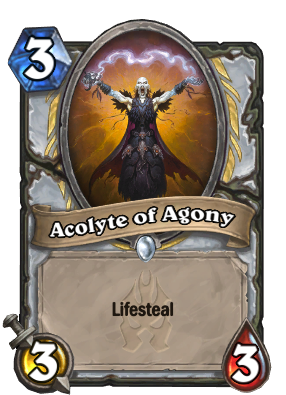 If the upcoming meta features a lot of aggro decks, as it always does, and highlander priest manages to make it to tier 2, I suspect this may be a staple in it. In any other priest deck, however, it'll likely see zero play. This card is not bad, but I think it sould be a neutral. Good card for arena and maybe might see moderate play in constructed. Priest only Earthen Ring Farseer that can either heal for 0 or infinite. Priests have much more reliable healing than this, sorry. Very nice in arena though. It only heals for 0 if they cast a spell on it. Which, if they do, is one less spell for everything else in your deck and even your face. You don't want to be wasting removal on low drops like this against Priest anyway so this is going to get healing a large majority of the time. Also, you and and most people seem to be looking at this card for it's healing aspect. That's not really the point of this card. 3/3 for 3 is OK stats. The point is this can get in 2 or 3 decent trades against early decks and makes use of your hero power to get in more trades because, a majority of the time, you're going to want to use your hero power on this more than you're going to use it on your face since it's healing you life as you trade with it anyway. 3/3 for 3 is OK stats. 3/3 for 3 is bad. You can play better cards that don't die to 2 drops. This card will heal you precisely one time. Aggro rolls over it. It has stas and an effect... that's all I can say about it. You're giving an understatted 3/3 lifesteal in a class that can heal themselves. This card art is garbage. Looks like just a boring streak of black, with very small amounts of white because of the head and arms, the random white squiggle shape, being held above his head, against a boring yellow background. There's no detail to be seen on the face except what looks like glee, I'm not sure. You can't hardly tell what this guy even is or what he's doing. His arms are just randomly thrown up in the air, which pulls the art away from the person looking at it. You can't examine this to really feel like you like or care about the art. This art is garbage, right next to the Jaina Death Knight art. Just awful. Felt the same way. Its weird, quite some art of this expansion feels kinda random. They also reused art from other cards or abilitys or warcraft related content. I wonder why they did that. This is the same artist as Tirion Fordring, definitely not as good though. Shadowfiend had better ability for the same stats and seen zero play. But you don't want to trade with Shadowfiend, because his effect was slow. Lifesteal like in this card is pretty much instant effect, because if enemy wants to trade he will heal your hero. This card is made for good trades so, I can tell that it can see play. I think this is too strong as a 3/4, cause with the 3/3 body this is like Earthen Ring Farseer most of the time, which is a good card. It's worse than Earthen Ring Farseer though because it will only heal face. 3/4 would've made it good not too good. Decent arena card at least. Might be quite ok-ish antiaggro 3 drop too, but i need to see all 3 mana cards to decide whether it's actaully good enough to put it in a deck. Life is to low to make it a good Divine Spirit + Inner Fire combo target. Would be playable as a 2/5.